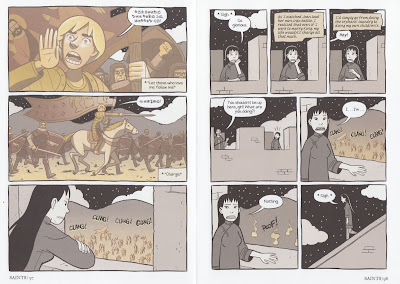 When Gene Luen Yang's American Born Chinese was published back in 2006 it received a lot of high praise and a whole slew of awards, not the least of which was the 2007 Printz Award for a teen book, the first graphic novel to win coveted American Library Association recognition. While ABC was widely embraced and helped firmly establish graphic novels as "legitimate" literature for children and young adults. It almost seemed like from that moment on people were looking for the next graphic novel to achieve that same level of recognition, and on some level it must have put some pressure of Yang himself to know how high a bar was set for him by his own work. I'll be honest, The Eternal Smile (2010), Prime Baby and Level Up (both 2011), were good but they didn't really strike me the same way ABC did. However Yang's latest, Boxers & Saints, an ambitious two-book story covering the Boxer Rebellion in China, may end up overshadowing his earlier work, and the fact that it just landed on the National Book Award shortlist is partial proof of this achievement. 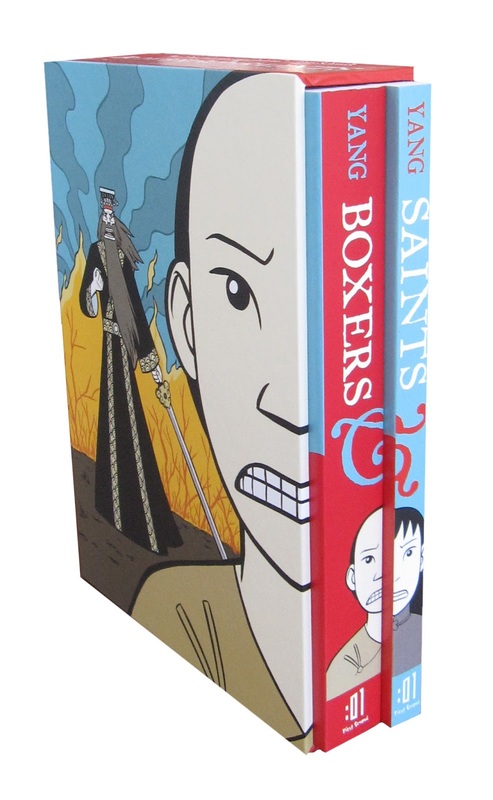 Which is all a highfalutin way of saying Boxer & Saints is a pretty awesome piece of storytelling, graphic or otherwise. For those of you who might have forgotten (like I did) or never really learned much about the Boxer Rebellion in school (uh, ditto), the extremely short version goes something like this: At the end of the 19th century, following years of drought, economic disaster, Imperialist forces, and Christian missions a rebellion broke out among nationalist forces that lead to a guerrilla-style war in Northern China against the foreigners that eventually was put down with the help of an eight-nation alliance. All told over 140,000 people died over the course of two year with a financial settlement to the Great Alliance that left China humiliated. That's the historical background. Yang's first book, Boxers, covers the growing Righteous Harmony Society, a group of fighters who came to believe that a disciplined life of diet, training, marital arts and prayer they could transform into ancient gods and warriors. This becomes fertile graphic storytelling for Yang as he is able to show the Boxers -- so named by Westerners because of their fighting style -- transforming during battles and becoming something more than human in their efforts. Our entry into the story is Little Bao who's village is disrupted by the arrival of a missionary flanked by an army who destroy their local shrine, appropriate provisions, and administer punishment for no reason. Little Bao and his brothers join other boys of the village in learning martial arts, their preparation for the peasant army they will become. What was startling (but shouldn't have been) was how quickly the village boys turned to fighting when there was nothing else for them to do; poverty and oppression will always foment organized rebellion. 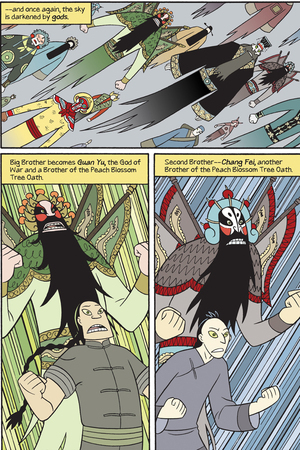 Eventually Bao becomes the leader of the Righteous Harmony Society, leading them to Bejing for a final confrontation with Alliance forces. Buried in the middle of Boxers is a chance encounter with Four-Girl, the unwanted daughter of another village who only gets a real name, Vibiana, once she converts to Catholicism. It's Vibiana's story that serves as the basis for Saints, and shows the other side of China's ruination at the hands of Imperialist forces. Where Bao is bolstered by the spirits of Chinese gods, Vibiana is visited by Joan of Arc whose own struggles mislead Vibiana into a faith that gives her self-worth at the expense of her national traditions and self-interest. The two books share two pivotal scenes where the character's paths cross at different points in their story, and if in those moments either of them had behaved differently toward the other their fates might have been radically different. If this all sounds like heavy stuff, especially for a graphic novel, it is, and yet it's as rich and rewarding as any historical fiction out there and somehow entertaining amid the misery. 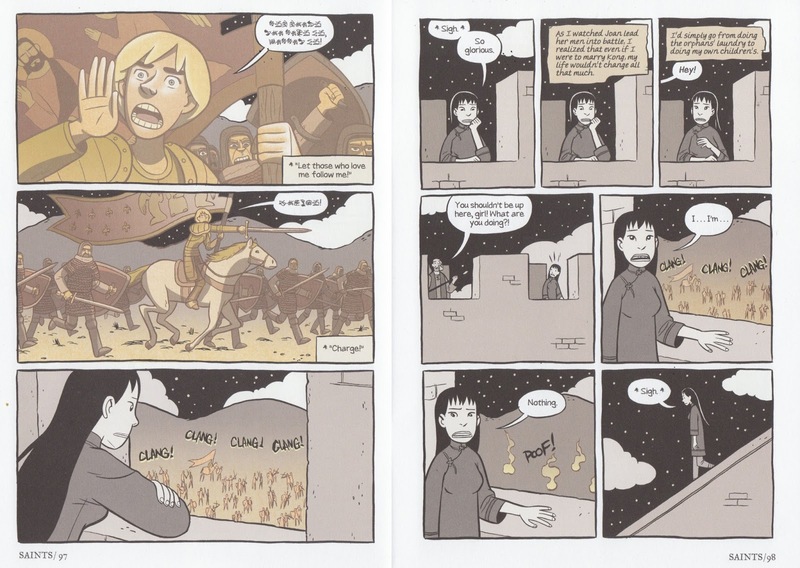 Credit Yang's clean drawing style, his own version of Herge's ligne clair used in Tintin, that elevates the comic to the level of literature and makes the historical a pleasure to explore. Boxers & Saints isn't a complete history of the uprising merely a couple slices of life during one of China's turbulent periods of history that is barely covered in most world history classes. I know I learned a lot from these two books, but not as much as I wanted to know, and afterward the book sent me online to read up on the bigger picture. If I have any criticism of this set, it's that Boxers is twice the length of Saints, leaving the latter to feel almost like the extra material left out of the former. It would have been far too unwieldy to have both stories cut together in a single book, but the short shrift Saints receives makes it feel slight. Saints is also colored in a muted, almost chromatic gray palate, which adds to the feeling of it being the neglected stepchild. It also doesn't help that both books can be purchased separately as well as in a boxed set; giving people the option I can almost see Saints going out of print while Boxers soldiers on. Perhaps one day there will be a "director's cut" with both books combined -- I would love a large sized Little Nemo-esque epic edition -- but until then the boxed set is still and awesome addition to the growing pool of quality graphic storytelling. Labels: Graphic Novel , History Matters , War - What Is It Good For?